Gadget is six months old, but will turn seven on September 14! We're unsure of her exact mix because the father is unknown and the mom is also but she's at least part Blue Point Siamese! She's the runt of a runt – her mom was also the runt of her litter so this means Gadget is extra tiny! Her mom was a stray found by family and originally we were going to bring her mom home but we ended up being unable to. Family kept her mom and then on Valentine's day she had Gadget and her siblings. Her mom had pushed her aside because she was so tiny, so Gadget learned to eat solid food on her own, at a much younger age than normal! She's pretty smart in that way. She took to a litter box the moment she saw it, too. She loves chasing our Pomeranian, Bear, and playing with my feet and hair. When she's not running around, she likes to sprawl on the bed in funny positions. She's taken on some of Bear's mannerisms, she likes to wag her tail like a happy puppy and runs to the door to greet us. She also likes belly rubs and playing "fetch". Thankfully, she also loves getting her picture taken! Hello, Miss Gadget! Happy Cat of the Day! What a darling kitten you are! You will be seven months old tomorrow - happy birthday! You are a lovely girl with your dark face and ears, pawsies and tail; and your gorgeous gem-like blue eyes! I'm glad you like having your picture taken, because you're a camera star! I hope your people will give you loads of petting and kitten tummy rubs for me! Not only are you darling -- you are a smartie girl, too! You go to the door to greet your people; you have learned to play fetch! You learned to eat solid food on your own, and had no problem learning to use the litter pan. You are a buddy kitty to Bear the Pomeranian, and I imagine you two have plenty of fun together! Best of all - you are a greatly loved girl! Happy, happy Cat of the Day to precious Gadget! Love to Bear the Pom, too! Concatulations dearest Gadget on being chosen COTD. You are an adorable girl, turning 7 months tomorrow. happy birthday sweetheart. Now everyone loves Gadget too. Total beauty, what a divine kitten. Dear Gadget, what a beautiful Siamese kitten you are. Your blue point coat looks so soft and plush, and your face those deep blue eyes is too cute. I am very sorry that your mom didn't take care of you, so you had to grow up fast. You learned to eat solid food at a very young age, and you immediately took to the litter box. You are a survivor and incredibly smart. You found a friend in Bear, the Pomeranian, and most importantly, you are sweet and affectionate. Gadget, you are a precious little lady. I wish you, Bear and your parents a great day full of celebration, and many more happy and healthy years together. Dearest Gadget, what an utterly adorable young lady you are! 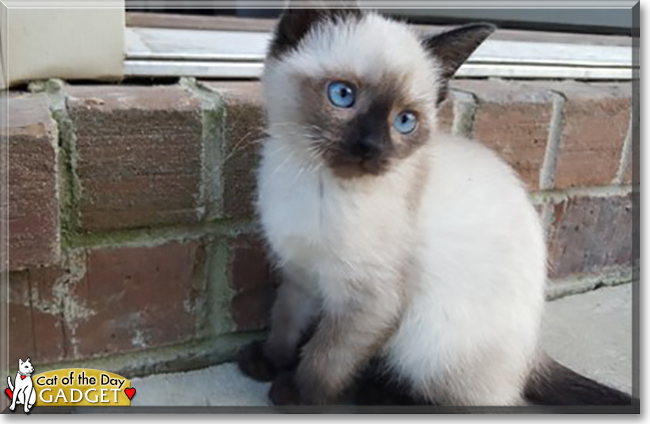 You are a precious Siamese kitten with those darkening points in your so-soft-looking fur and that sweet face with the long white whiskers and the lovely blue eyes. Thank you for sharing those great photos with us! You are absolutely gorgeous growing girl in every one of them. I wish I could reach through the screen and way down to Bono, Arkansas to pet you and give you a belly rub, and pet your Pomeranian buddy Bear and rub his tummy if he likes, too! I can't, of course, but I know your loving and beloved Purrrsons will pet you both for me . And what a delightful story you have to tell! You are very tiny, the runt of a runt! Your mom was a stray found by a family, who kept her. You and your siblings were born on Valentine's Day, so you will be seven months old tomorrow. An early Happy Birthday to you from us! You're a very smart girl, learning to eat solid food on your own very young and taking to the litter box right away. You are full of energy and make your dear Purrrsons smile with your antics, chasing Bear around, playing with Meowmie's feet and hair, and sprawling on the bed in funny positions. You've taken on some of Bear's mannerisms, wagging your tail like a happy puppy and running to the door to greet your Purrrsons. You enjoy belly rubs and playing "fetch" and, fortunately for us, getting your picture taken! You and your dear Purrrsons and Bear all love each other very much, don't you. What a wonderful love-filled home you share! 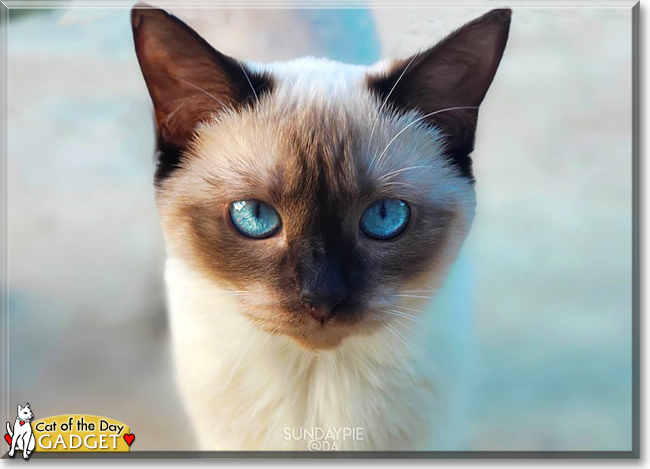 Congratulations, darling Gadget, on being chosen today's Cat of the Day! We hope you and your dear Purrrsons and Bear and all your family and friends are enjoying a fine celebration, full of fun and lovies and all your favorite games and treats. Good evening, Gadget! Happy Cat of the Day to you, and early happy 7th "Monthday" wishes to you, too! Oh, be still my heart!!! What a beautiful, floooofy, most precious baby girl you are, Gadget! Those sparkling, ice blue eyes of yours are simply stunning! Your photos have me total meltdown mode! Thank you for posing so patiently for the camera! And how telling your birthday being Valentine's Day, for you truly are a stealer of hearts! You may have been the "runt of the runt," but in all things that truly matter, looks and purrsonality, you're queen-sized! How lucky your human is, having a beautiful, sweet and loving furkid in you, Gadget! What fun she/he is in for, watching you grow and learn, the two of you sharing so many happy times over the years to come, making memories to last a lifetime! You truly are a treasure, sweetheart, just as special as can be, one in a million! Thanks for the BIG smiles, Gadget! Meeting you, reading your proud human's love filled tribute and seeing your heart-melting photos, has made my evening! Hope you're enjoying a very special Cat of the Day celebration...playing fetch; romping with your pup sibling, Bear the Pom; grooming your human's hair and feet, hehe; receiving countless belly rubs; being loved and pampered to pieces! Lots of love, cuddles and kisses to you, precious Gadget, our very special and most deserving Cat of the Day, EVERY day! Love to dear Bear the Pom, too! Have a Happy 7 Month Birthday! Congratulations on being Cat on the Day, Adorable Gadget! Firstly, let me say how strikingly beautiful those blue eyes of yours are! They caught my eye as soon as I saw your pictures! Your Siamese coat is also very wonderful and pretty! You were the runt of your litter and unfortunately your mother pushed you away because of that But luckily you managed fine on your own and won over the hearts of your people family!! You seem to be adjusting to your home well and you have even started to act like a dog! You wag your tail as you say hello to your family when they come in, how adorable! You are so special, dearest Gadget. Have a very happy 7 month birthday tomorrow! Best wishes to you and your entire family!